While boxing gloves were made to cushion your well-placed uppercuts, steel fists were made to beat the snot out of your enemies' pineal glands. "What are pineal glands? ", you might ask! We at Mann Co have no idea ourselves, but what we do know is that these babies are made of freaking steel! The Fists of Steel, commonly abbreviated to FoS, are a community-created melee weapon for the Heavy. It is a pair of large robotic gauntlets, appropriately team-colored, that encase the Heavy's hands. While this weapon is active, it reduces damage from all sources that are not melee-based, be they hitscan or projectile, by 40%. As downsides, all melee attacks against the Heavy will deliver double damage when this weapon is active, and the Heavy will take two times longer to holster the Fists of Steel, compared to the default Fists. Additionally, the user will receive a 40% healing rate penalty and a 40% overheal reduction from Medic's secondaries. Most taunt attacks are in fact high-damage projectile or hitscan attacks and the damage reduction is sufficient to make those taunt attacks survivable. Taunts that are resolved as melee attacks (Decapitation, Dischord, and Fencing) are not affected by the damage reduction. The weapon was originally created for the Fancy vs. Nasty Update as a replacement for the Killing Gloves of Boxing and has since been officially added to the game. The Fists of Steel were added to the game. The Fists of Steel was added to the Mann Co. Store, made craftable, and included in random drops. The Fists of Steel was given a unique kill icon. Added a RED team skin to the Fists of Steel (having a very strong red hue). Updated the RED team skin for the Fists of Steel (changing the color to a diluted bronze). The crafting cost of the Fists of Steel was changed from 2 Scrap Metal and a Gloves of Running Urgently to 1 Reclaimed Metal and a Killing Gloves of Boxing. Added community contributed response rules to the Fists of Steel. [Undocumented] The Fists of Steel was added to the crafting blueprint for the Eviction Notice. [Undocumented] Fixed the Fists of Steel not hiding Heavy's default fists. Fixed the Fists of Steel not reducing damage from ranged weapons that use energy rings. Added penalty of increased holster time by 100%. [Undocumented] Updated firing sounds for the Fists of Steel. Added 40% overheal reduction while active. Added 40% healing rate penalty while active. [Undocumented] Updated draw sound for the Fists of Steel. Fixed the "-40% health from healers" penalty on the Fists of Steel (it wasn't active). 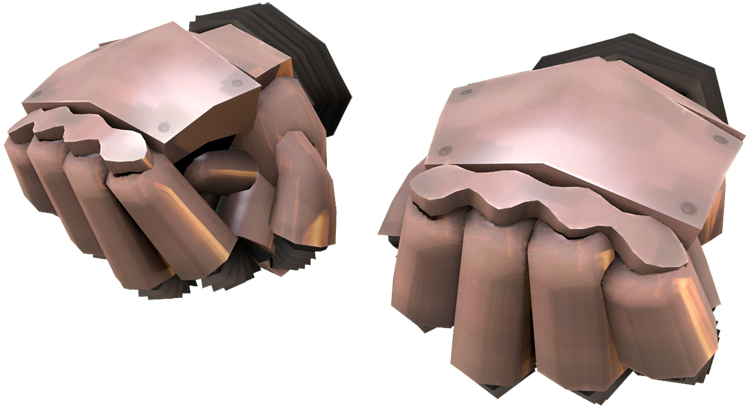 If the player has not drawn the Fists of Steel when respawning or changing classes to Heavy, they will not have the Overheal Penalty until the Fists of Steel are drawn. The Fists of Steel replacement came with a unique sound set, making the fists seem more robotic. However, after its inclusion in-game their punches were given a custom metallic sound. The robotic taunt sounds were never included. 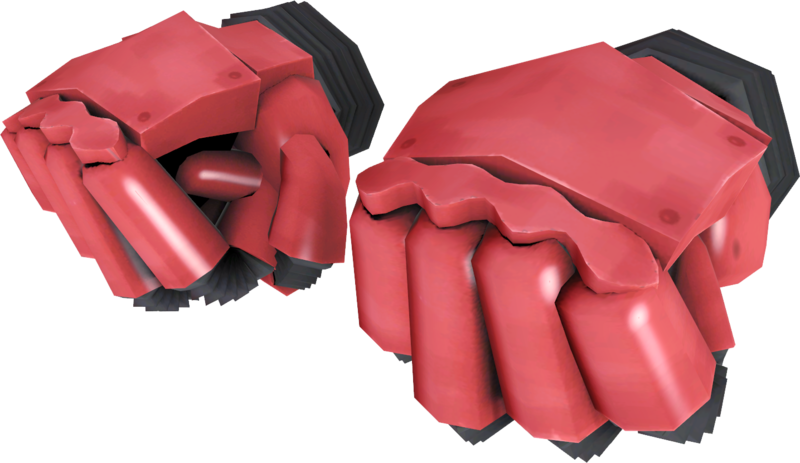 The name of the weapon, and the weapon's model, were inspired by one of the Heavy's voice clips which proclaimed "My fists! They are made of STEEL!". This voice clip was later attached exclusively to this weapon. This in turn was inspired by a catchphrase by Duke Nukem, specifically his proclamation that "I've got balls of steel!" Previous version of the RED team skin.